Saturday, October 31 1908 -- Herriman commemorates the soon-to-be third losing campaign of Democratic candidate William Jennings Bryan. There was another memorable meeting place for years, the top floor of Mouquin's in Fulton Street, where the "Hammer Club" grew, by degrees, into an institution. Beginning with a daily gathering of a few jealous souls who discussed at noon the foibles of their heartless masters and their own unselfish efforts, it acquired in some unknown manner the name and character of a club. I was its permanent president, probably by right of my unearthly beauty and flow of language (with the exception of an interval of revolt—brief and cruelly suppressed), during its long career. Although we had no constitution or by-laws, I had the power to fine any member a bottle of Pommard at my option. This insured a flow of sentiment and good feeling, hence the club endured. Police captains, bishops, priests, conjurers, judges, theatrical managers, brokers and poets mingled with editors and artists at these daily luncheons, for in those golden days before Prohibition, income taxes, balloon-tires or hardened arteries men took life less seriously. Nor were these meals drinking bouts. Undoubtedly, much time was often lost at them by individuals who should have been at work, but grand ideas were often gained. Not so very long ago I dropped in on Franklin P. Adams, then on the Tribune. He invited me out to lunch and we went around to Whyte's. There a number of young fellows joined us one by one, and at the end of the meal there was the usual gentle skirmish for the check until it was proposed to match for its payment. I had come to town with about ten or fifteen dollars in my pocket, plenty for the average farm-hick's afternoon enjoyment, and I viewed this suggestion with ill-concealed dread. As may be guessed, we matched and I paid the check. It was for eleven dollars and thirty cents without the tip, but, thank Heaven, I had enough to get back to Goshen on. Now a thing like that could not have happened at the old Hammer Club. Since then I have shied at all luncheon invitations except those of publishers, who have some sense of the value of money. In these days of huge circulations, unbounded advertising and universal commercialism, newspaper individuality or personality has become almost extinct and it is difficult to comprehend the sort of popularity which the World so swiftly attained. It was read in the Tennessee mountains and in Mississippi valleys, and while it had its enemies it had a thousandfold more friends. When in my enthusiasm in '86 I predicted a million circulation I was gently derided, but its phoenix-like rise warranted the prediction. Of course, I did not foresee that ten years later the young and opulent Hearst, the best judge of sure-fire hokum living, would buy Albert Pulitzer's Evening Journal and proceed to do everything J. P. had ever done, and in a bigger and more sensational manner. Which leads me to relate a most curious and amazing bit of personal history to illustrate this point. Raymond Duy Foster, a boyhood chum, had joined me in buying a thirty-foot sloop of ancient lineage from ex-Gov. Leon Abbett, and we spent upon her all our spare time and much of our cash. When the Puritan was to race the Genesta in '85, Pulitzer ordered George W. Turner, his business manager, to engage a steamboat for the occasion. This boat bore a gigantic banner on port and starboard with the legend "THE WORLD" in letters four feet high. Everybody who could escape from the office was on board with a host of the paper's friends. As we moved slowly down the river amid a tangle of vessels, Turner asked me: "Where is your yacht today, Mac?" "Foster has her down the bay somewhere," I replied, noting a hint of satire. Then, seeing far over toward the Jersey shore a long black yacht sailing northward, I added, unconcernedly: "There she is, I think, sneaking up the river." Everybody within hearing concentrated his gaze upon the distant craft, and some uttered jealous and malignant comments upon the fact that a mere cartoonist could afford such a plaything. Suddenly the beautiful, costly craft luffed and ran, half-off the wind, straight for us. As she neared us, I discerned a group of guests in yachting attire about her stern and fifteen or twenty white-clad sailors scattered along her hundred-and-twenty-foot deck. My heart flopped as I realized that presently she would cross our bow and all would read on her gilded stern the name of a famous yacht and my reputation for veracity would be a total loss. She flew nearer, the cynosure of jealous eyes. Only a cable-length away, however, she came about cleverly with every face aboard of her fixed upon the World's modest banner, and as she passed us like an albatross in flight, a hoarse voice from her deck roared: "Three cheers for McDougall!" which cheers rang out with a will across the rippling waters. We returned the salute with interest, I being the cheermaster. She bore no name astern, nobody aboard of us recognized the peerless beauty, and I never learned to whom she belonged, but, of course, he was a World admirer. I came, in time, to believe she was the Flying Dutchman of seamen's fables; certainly, if not a miracle, it was a marvelous coincidence. Airily I waved my hand at her, made some comment upon the fit of her sails or the like, and turned to enjoy with diabolic zest the expressions upon the faces of my envious confreres. This inexplicable happening made me a yachting authority on the World and firmly established my credit with a couple of Fifth Avenue tailors who were the guests of Jim Townsend, our Society Editor, that day. Also, it may teach young and aspiring cartoonists the value of signing their names in large plain letters so that they may get as much advertising as the owner of the paper. After J. P. had, so to speak, erected the Statue of Liberty pedestal, I was called upon to design a new heading for the paper and substituted the figure of Liberty for the globe, Jay Gould's selection. 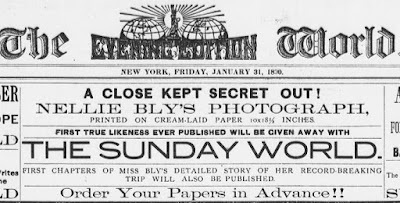 This is the basis for a boast that although I left the paper in 1900, not a day has passed that I did not have a picture in the World. An exciting experience of that year of the Puritan-Genesta race was the blowing-up of Hell Gate, which operation it was feared would seriously jar the old town, but the jolt was as nothing compared to the awful Seeley Dinner. Seen from the press boat, it was only a majestic, foam-laced curtain with deeply serrated edges raised against the summer sky for perhaps two seconds and falling in dull thunder. Realizing the impossibility of drawing its outline correctly, my pencil flew automatically across the paper following the rising peaks of green water, but lo! when the picture was printed and afterward compared with the official photographs, my hasty sketch was found to correspond almost line for line! This, of course, was purely accidental. The only man to whom the gift was given to draw accurately a scene merely glimpsed was Dan Smith, who came later upon the World to enormously raise the prestige and status of the downtrodden but patient toilers, not only by his piety and sobriety, the same being the son of a parson, but by his marvelous technique. He did not need to make sketches, this wizard of the pen and brush, one swift squint at the scene was enough. He is going strong still, but I wonder that our envy did not poison him in early life! Among the many admirable qualities attributed to the mythical Joseph Pulitzer by his secretarial biographers who saw him through the larger end of the telescope, was a marvelous initiative. As a matter of hardpan fact, eager and energetic as he was, his genius was mainly evinced in his capacity for extracting loyal, hard work from his crew, and this was effected by office oratory of a sort I have never seen displayed by any other newspaper proprietor. I have known no other boss who personally infected his employees with fiery ardent energy; each one whom I have studied shot a jolt into his managing editor when and as needed, and left the transference of the enthusiasm to him. Thus Bennett, Dana, Hearst, Munsey and Wanamaker managed, and none of them was served as was J. P.
When he first came to New York, both he and Cockerill knew very definitely just what their policy was to be in order to electrify the corpse. 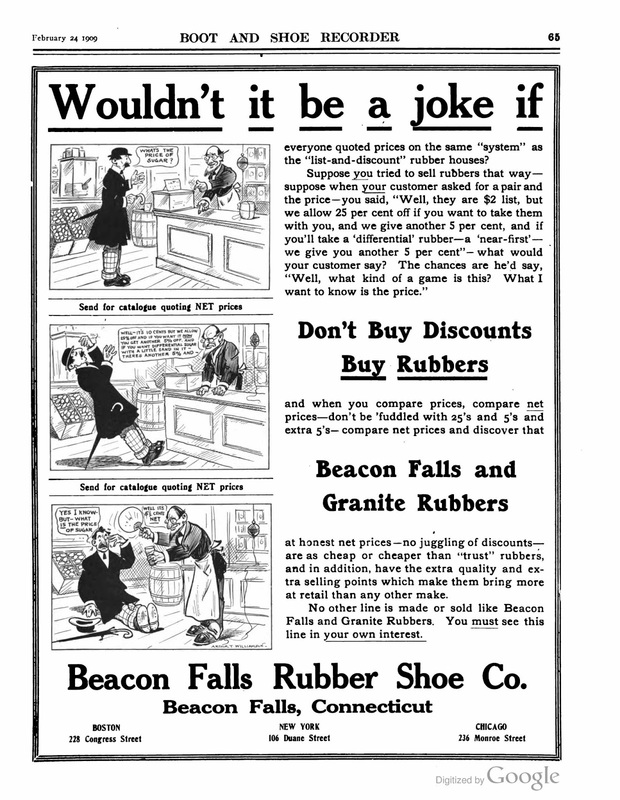 A little gum-shoeing and thought sufficed to show them that all New York needed to set its monetary glands flowing was a daily dose of new, tingling sensations, and thenceforth the main demand was for novel and striking ideas. Circulation! Yet more Circulation! Big Ideas and more of them! And ideas were as plenty then as mushrooms in an Orange County pasture, being trampled underfoot unnoticed by the editors of the sedate, old-fogy papers, who thought that a bit of snappy personal repartee on the editorial page was a humdinger and that pictures, for instance, were degrading, if not actually improper. "Splash the Sun with penny valentines! McDougall, I'd see the Sun in hell before I'd permit a frowzy woodcut to deface it!" "It looks as if you'd be in hell if you don't!" Then I slammed the door and almost fell downstairs in getting away from there. Dana came to using pictures ultimately, and very good pictures, but without any enthusiasm, yet he employed superior artists like C. J. Taylor, W. A. Rogers and Wilder. The trouble was that he would not splash and use penny valentine effects and J. P. took his scalp, although not without a long hard fight that left permanent scars on the hides of both. Some of the bitter personalities indulged in by the two able scrappers on their editorial pages would read now like a ruckus between two movie magnates, and the staffs of both sheets were kept in a constant state of expectation and delight. J. P. always cherished in his heart a sincere if unacknowledged veneration for rank and family. This was probably atavistic, coming as he did from a land where rank meant all that is desirable but, to a peasant, unattainable. He showed this feeling by an exaggerated contempt for persons of wealth and standing, yet the truth is that he was moved by quite different feelings, a strong hunger for wealth, luxury, power, predominating over all other emotions. This was manifested many times by certain trivial circumstances in those days when I was in constant contact with him and studying his words and actions. These betrayed that he was moved by a keen desire to establish amicable relations with New York's Four Hundred and their guide and counselor, McAllister. This was the source of his keen interest in a heavily manned society page headed by James B. Townsend, aided by Gil van Tassel Sutphen, a pair of live wires who acquired the fluttering Town Topics only to sell it to old Col. Mann, who made a public nuisance of it for years. Townsend was the scion of an old New York family and knew everybody in town who owned a dress-suit. It was claimed that he was the first New Yorker to kiss the hand of the Infanta Eulalie on her arrival here, but I think Ward McAllister beat him to it by hours. I am convinced that very few of the "Big Ideas" ever germinated in Pulitzer's harassed brain. I know that certain memorable achievements when first submitted as suggestions were greeted with scorn and often quite stubbornly opposed, and others of lesser importance, even trivial and silly schemes, such as Brisbane's proposed crusade against the cigarette or Grozier's plan to communicate with Mars, were hailed as genuine whales. The Grozier idea was sprung at a conference at which I happened to be present, for I abhorred those time-wasting meetings and avoided them. E. A. Grozier, afterward the owner of the prosperous Boston Post, was city editor, and he proposed to signal to Mars by means of enormous letters of fire on the desert plains of Nevada or Arizona, signs that would make the blasé inhabitants of that distant planet sit up and take notice. Eddie had his scheme elaborated in detail and it impressed one and all. It was surely a Big Thing in Ideas. The conference discussed the mechanical and physical difficulties, ways and means, costs and supply problems, with animation until, at last, in my irreverence for massed brain work, I threw a monkey wrench into the works by asking Grozier what language he would use on his colossal billboards, for, strange to say, nobody had thought of this important detail. There was a great silence. "I'll tell you what I think!" I suggested in mock seriousness. "I'd make them in Hebrew letters, for there certainly must be Jews up there, and you'll get quick action." J. P. fell back in his chair with a sudden spasm of genuine laughter, a rare event, and in a few minutes there was nothing left of the Mars idea but a pile of papers. 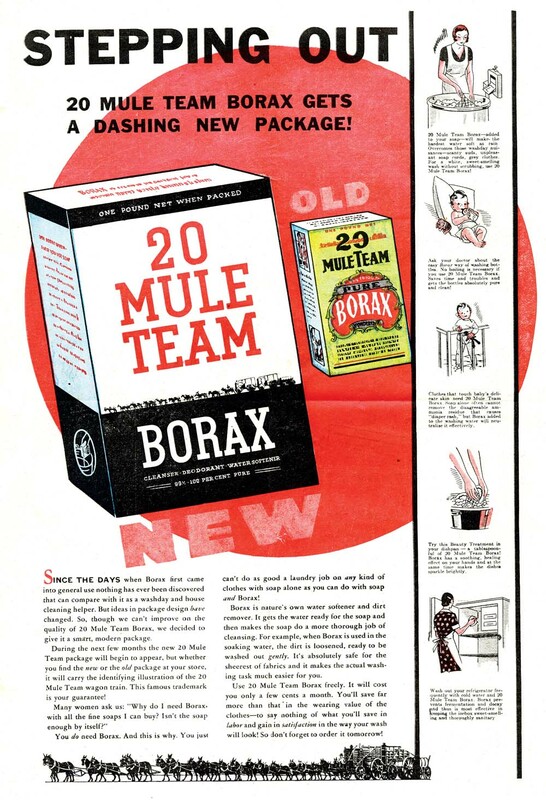 Here's an interesting promotional item from the radio show Death Valley Days, which was sponsored by 20 Mule Team Borax. 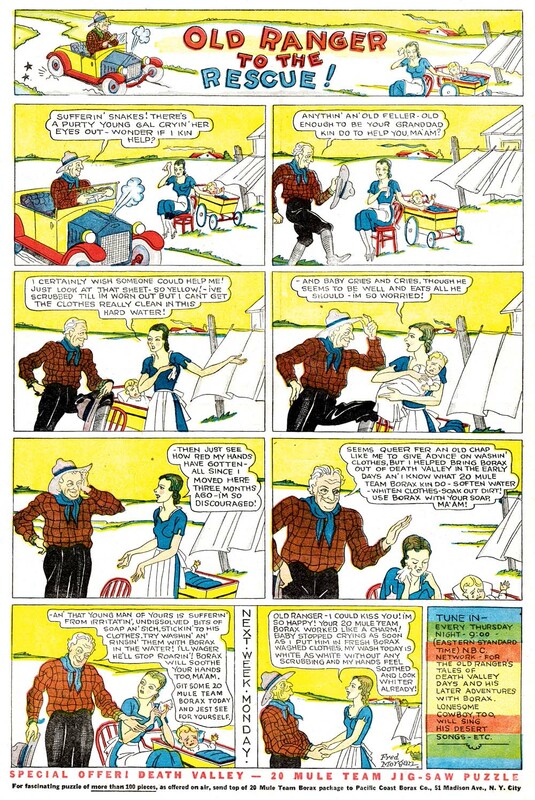 Although there is no copyright evident on the 4-page 'comic section', it almost certainly dates from 1938. 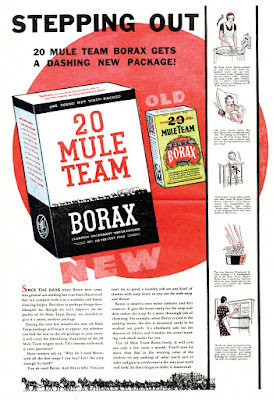 The new box for20 Mule Team is heralded on page four of the promo, and that gives me a way to date it. Checking on period advertising of the product, I find the old box in 1937 ads, and the new one in 1938 ads. So what's actually intersting about this promo? Well, to me it's because the comic strips are signed by Fred Morgan. 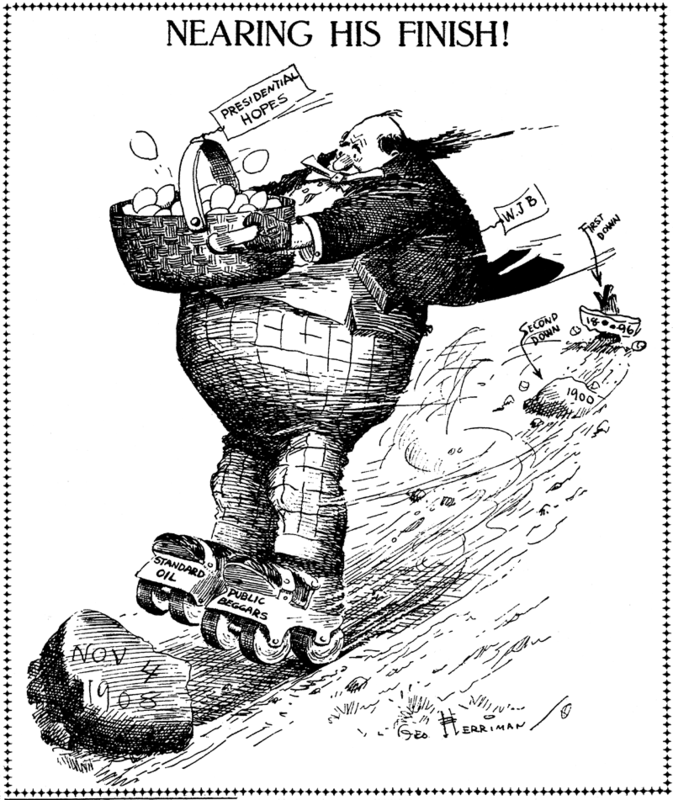 As you may recall from a long-ago Ink-Slinger Profile by Alex Jay, there has been some confusion regarding the biography of this supremely great editorial cartoonist. The problem stems from the fact that several other Fred Morgans, one a British painter, another a cartoonist who went by the working name F. R. Morgan. Presuming that the above work is by the old Philadelphia Inquirer editorial cartoonist Fred Morgan, and the signature seems to bear that out, he seems to have still been working at the very advanced age (for those days) of either 73 or 78, depending on which offered birth date you believe, and certainly debunks one correspondent's belief that he died in 1932. 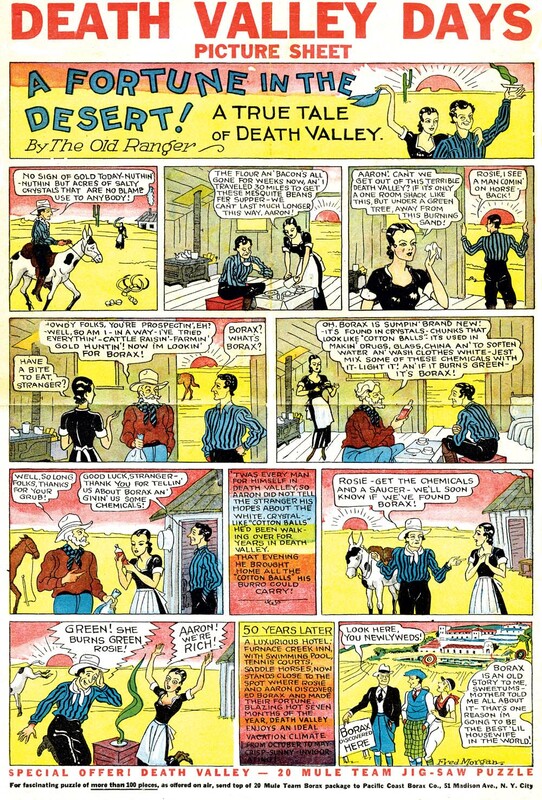 Quite frankly, the quality of Morgan's work here tends to indicate a cartoonist who just doesn't really have their full chops anymore, but I'm surprised that an advertising agency of that era was working with an artist in his 70s. Well, as a fellow who hopes to still be producing something worthwhile in my 70s, I say three cheers for Fred! In the 1930s Diana Thorne was becoming very well-regarded as an accomplished animal artist. Her favorite subjects were dogs, and she drew them for books, magazine covers, even taking commissions to make portraits of the dogs of the rich and famous. She was especially well-known for her childrens books, which she produced in great numbers. 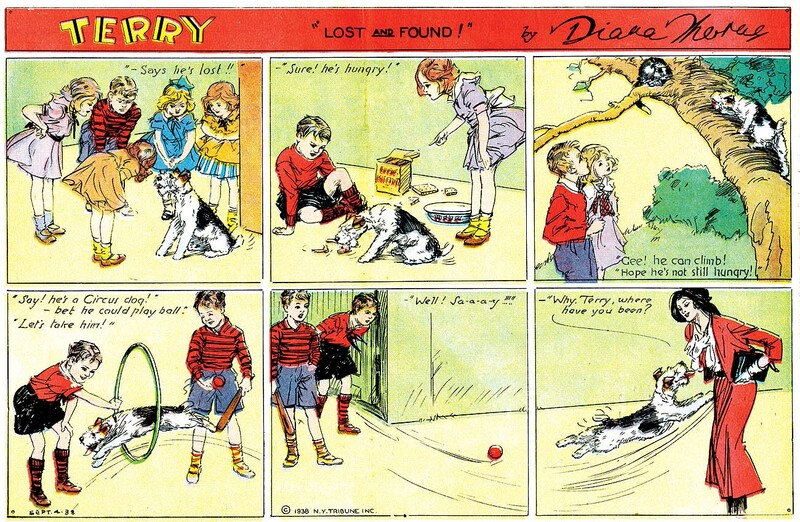 Because of her increasing fame, it's not certain whether she approached the New York Herald-Tribune, or they approached her, to create a Sunday comic strip series. But one way or the other, she did create Terry, a Sunday-only strip about a dog (a terrier I presume). Generally speaking, Thorne did not participate in the writing duties of her children's books, so I'm guessing there might have been an uncredited writer on Terry, but that also is unknown. What I do know is that the strip did not catch on (a common problem for the New York Herald-Tribune, which seems to have had a really ineffective marketing department), and Thorne probably decided pretty quickly that the strip was not worth her valuable time. Terry ran from March 5 1938 to February 25 1939, indicating that Thorne and the Herald-Tribune were perfectly fine with parting ways at the conclusion of a one-year contract. For much more information on Diana Thorne, see this website. Arthur T. Williamson was born in Kentucky in July 1869 according to the 1900 U.S. Federal Census. According to the 1870 census, Williamson was the only child of John, a grocer, and Alvinie. They resided in Paducah, Kentucky. In 1880, Williamson, his mother, a dress maker, and her brother, John Hughes, resided in Chicago, Illinois, at 251 Western Avenue. Specific information about Williamson’s education and art training has not been found. The Lakeside Annual Directory of the City of Chicago (1887) had a listing for a “Williamson Arthur, engraver, bds. 104 Aberdeen”. The Daily Inter Ocean (Chicago, Illinois), December 22, 1894 had an advertisement for its Sunday Christmas issue with two full-page illustrations by Williamson. The Daily Inter Ocean, August 26, 1896, announced a new series to illustrated by Williamson. The Inter Ocean prints today the first of a series of articles by Robert P. Porter. These articles will be profusely illustrated by Arthur T. Williamson, the well-known artist of Chicago. 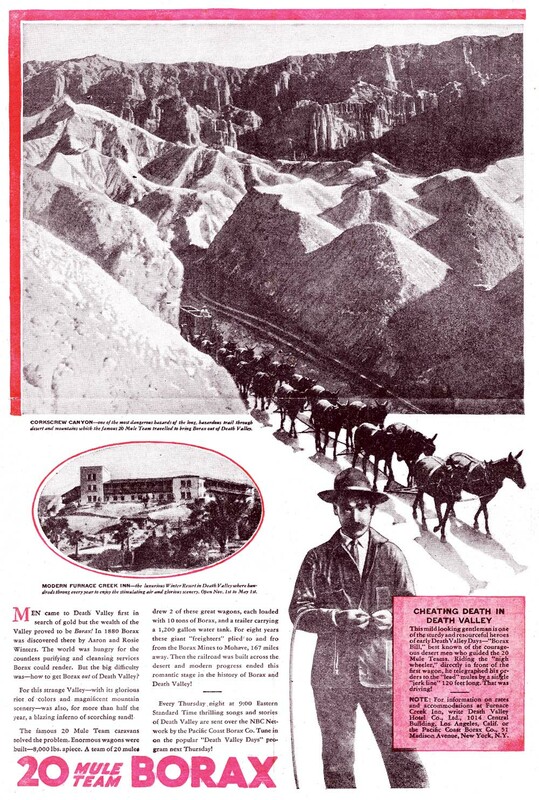 Mr. Porter, with his artist, has been commissioned to take a rapid run through the industrial regions of the West and Northwest and find out as far as possible the conditions with which trade, commerce, agriculture, and manufacturing are at present confronted, and faithfully report the same for the benefit of the readers of this journal. These articles will only deal with facts, and the illustrations, which will be of the best quality, are intended to add to their popularity…. …Mr. Porter and Mr. Williamson are now on a tour of the Northwest. They will visit the lumber and iron ore districts and make inquiry in the principal cities of Illinois, Wisconsin, and Minnesota, and on returning to Chicago will take up the same line of work in Iowa, Nebraska, and Kansas…. The Cook County, Illinois, Marriage Index, at Ancestry.com, recorded Williamson’s marriage to Bessie S. Crafton on October 25, 1897. According to the 1900 census, Williamson’s address 3341 63rd Place in Chicago. His family included his wife, son, step-daughter and mother. Williamson’s occupation was designer. The Holt County Sentinel (Oregon, Missouri), January 4, 1907, reported the death of Williamson’s son. De Witt Williamson, aged 8 years, died in Chicago, Wednesday, January 2, 1907, from diphtheria. He was the only son of Arthur T. Williamson and wife. Mrs. Williamson was formerly Miss Bessie Soper, of this city. They have two daughters left, both of whom are down with the same disease. Their many friends here extend sincere sympathy to them in their hour of affliction, and hope that the children now sick with this dread disease, may recover. Chicago business directories for the years 1903 to 1905 listed Williamson’s occupation as designer and address at 325 Dearborn. The 1909 directory said he was an artist in the Athenaeum Building at 26 Van Buren. The Beacon Falls Rubber Shoe Company advertisement featured Williamson’s three-panel strip which ran in the Boot and Shoe Recorder, February 24, 1909, and The Shoe Retailer, March 20, 1909. Williamson’s drawings of women appeared in the Inland Printer on September 1909; February 1910; and April 1910. In the 1910 census, freelance artist and illustrator Williamson, his wife, daughter and mother resided at 3249 63rd Place in Chicago. Williamson’s studio was located on Van Buren in the 1910 to 1912 directories. The 1914 directory listed his studio at 537 South Dearborn. Williamson illustrated the serial, My Lady of the North, which was published in 38 chapters in many newspapers including the Willmar Tribune (Minnesota). 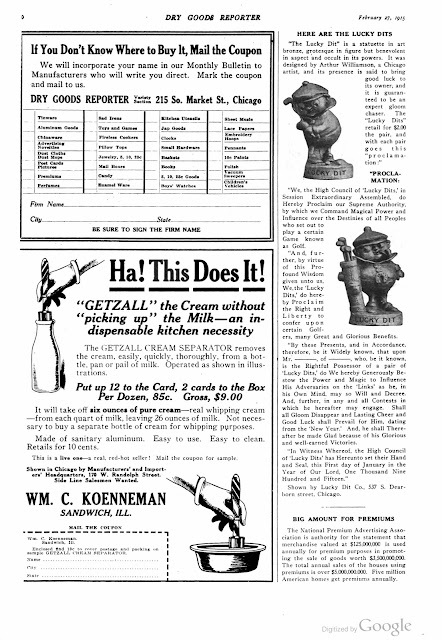 The Dry Goods Reporter, February 27, 1915, announced the release of Williamson’s new product. The Chicago Daily Tribune, June 4, 1915, published a death notice for Williamson’s mother who died the previous day. 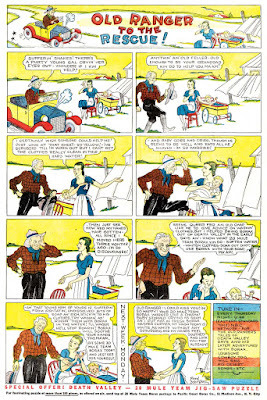 American Newspaper Comics (2012) said Williamson produced The Truly Travelers, for the Chicago Herald, from September 19 to October 31, 1915. 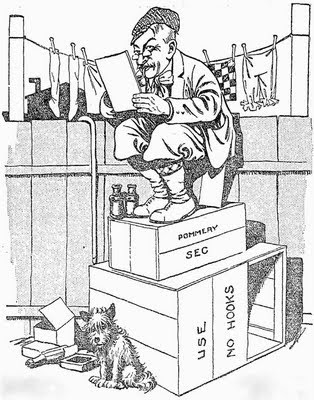 Williamson’s home address remained the same in the 1920 census which said he was a magazine illustrator. The status and whereabouts of Williamson and his family after the census are unknown. Two of his paintings can be viewed here and here. 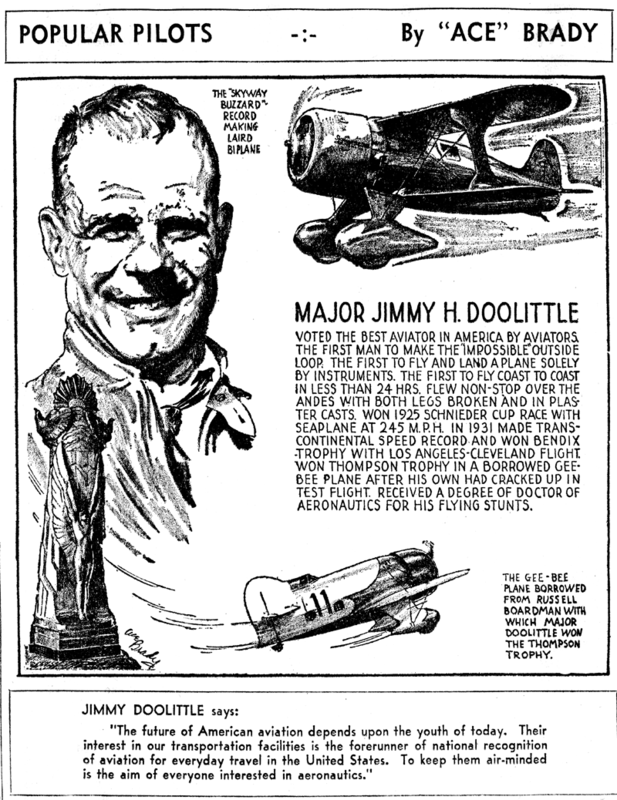 We've discussed Hearst's Junior Birdmen weekly aviation pages before, and here's another of the cartoon elements of those pages. 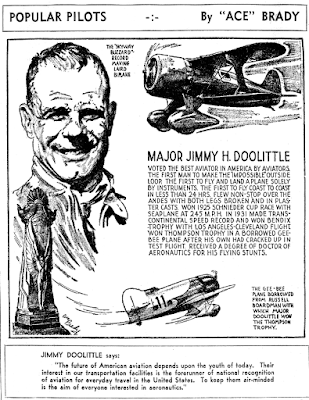 Popular Pilots ran on the pages from April 28 to sometime in July August 28 1935, a very short run. The panel offered up not only capsule biographies of famous aviators, but quotes attributed to them, in which the Junior Birdmen are invariably said to be the best thing for American youth since the invention of the Baby Ruth. 'Ace' Brady, who signs the panels, is an enigma. Many of the Junior Birdmen features were credited to famous aviators, and I guessed that was the case here. But I find no senior birdmen who went by that moniker. I'm also not aware of any cartoonists named Brady who would be likely suspects for penning this feature. Checking the FultonHistory site I found the panel appearing in a couple August editions (18th and 25th) of the Albany Times-Union. While those retained the title line with the "by 'Ace' Brady" credit, the panels were signed by Jon L. Blummer. 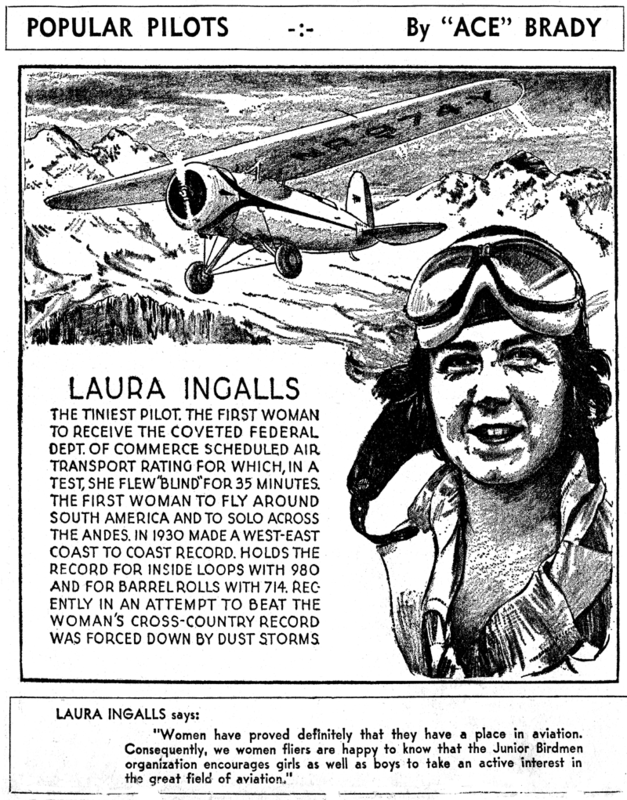 From the same site I got the September 1, 1935 issue of the Syracuse American which had an introduction to the forthcoming Air Conquests. 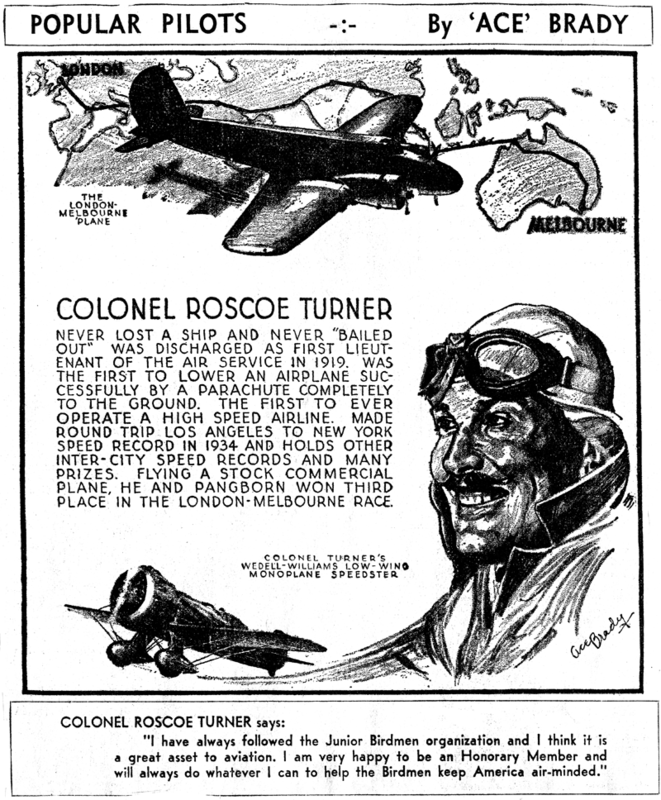 That intro said that Air Conquests "will be drawn by the famous artist who so ably portrayed the activities [of pilots] published on this page known as 'Popular Pilots'." So I'm starting to think that Ace Brady is Jon L. Blummer (of Hop Harrigan fame). Apparently there was some scandal in the family in the '20s so he may have used the Brady penname before settling on Jon L. Blummer. Sounds like Jon Blummer's our guy. But I'd like to verify that the art style on my samples and the later ones you found match up. I've been beating my head against the Fulton wall for a few hours now, and I just cannot tease those pages you refer to out of that darn website. I even tried a mass download of Syracuse American to no avail. PLEASE can you post links to these pages? Hope all those links are right and will work. 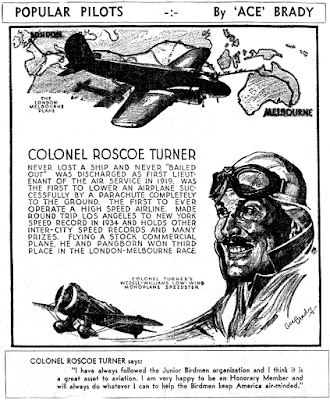 A Fulton search of Popular Pilots as an exact phrase brought up the results. Thanks very much for the links DD. I must confess that I did not think to try the internal search on Fulton's site, as I've never had it work in the past. I was doing site searches using Google. Okay, I'm convinced Blummer did both the credited and uncredited panels. The Kingsford Smith panel is a dead ringer.